In the last five years, London-based imprint Rednetic have delivered a steady stream of elegant electronic records. While the label’s scope has considerably expanded over the years, the focus has largely remained on classic electronica. The label was set up in 2002 by Mark Streatfield and Joseph Auer, and the first release was Streatfield’s debut album as Zainetica, Escaping Dust. Since, Auer, who had then moved from London to Tokyo, released the Kyoto Tokyo 2001 EP, and further releases by Utility Player, The Vizier Of Damascus, Inigo Kennedy, Tommy Bass and Boltfish co-founders Will ‘Cheju’ Bolton and Murray ‘Mint’ Fisher, amongst others, have firmly established the label as one of London’s best imprints. 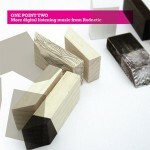 In 2004, the One Point One compilation collated tracks by some of the above artists together with offerings from Ochre, Sidechain and F.E.A.R. Three years on, the second instalment in the series harvests a further fourteen tracks of classic electronica and techno, with contributions from Mint, Tommi Bass, Liberation Jumpsuit, Infinite Scale, Boc Scadet, Joseph Auer, Sunosis, Zainetica and many more. Very much like its predecessor, One Point Two spans a vast array of genres, from the elegant electronic swathes of Boc Scadet’s She Spoke Of The Sky, Zainetica’s Awaken or Sunosis’s Leap and the ambient expanses of Polestar’s Retro Future, Infinite Scale’s Cell Out or The Vizier Of Damascus’s Murmurs to the Detroit-infused offerings from Cheju’s Hubl or Inigo Kennedy’s Faraway Towns to the old style techno of Tommi Bass’ Electro Glitch 2007 and the acid funk of Liberation Jumpsuit’s One Night Stand. The album kicks off in gently mood with the delicate formations and beats of Mint’s Queasy, but things sharpen up quickly, first with the electric charges inflicted by Tommi Bass, then with the dirty electro funk distilled by Liberation Jumpsuit, before Boc Scadet applies lush dreamy textures and brings One Point Two right back into melodic mode. A perfect reflection of the path followed by Rednetic over the last first years, the album then alternates between delicate pieces (Polestar, Infinite Scale, Joseph Auer) and more upbeat moments (Utility Player, Cheju, Inigo Kennedy). Rednetic have gained confidence with every release, and the label’s audience has been growing accordingly. This second compilation brings together the many flavours of Rednetic and provides an ideal entry point for one of the most consistent independent imprints around.